This section provides a tutorial example on how to use the setContentType() method of the javax.swing.JEditorPane class to set force the editor pane to display content in HTML format. 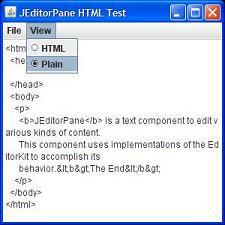 Now I want to try the "text/html" content type with the javax.swing.JEditorPane class. In this tutorial example, I want to add a new menu, "View", with two functions, "HTML" and "Plain". If you click HTML, the text in the editor pane will be displayed in HTML format. If you click Plain, the text in the editor pane will be displayed in plain text format. Of course, this is done by using the setContentType() of the JEditorPane class. "<p><b>JEditorPane</b> is a text component to edit various"
+" kinds of content.\n\nThis component uses implementations"
If you run this example, you will see a text editor pane displayed with the initial text content and a menu bar with the "File" menu and the "View" menu. Initially, the content is displayed in HTML format. the <b> tag is properly processed. You can <b>The End</b> at the end. setContentType() method will actually remove the current text content in the editor pane. This is why I have save the content into a variable first.